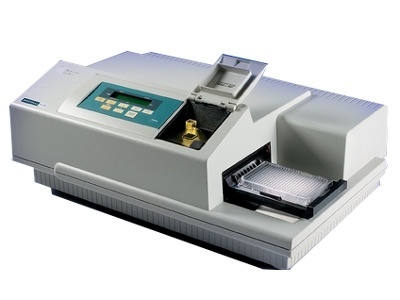 The SpectraMax® Plus 384 Microplate Reader gives walk-up convenience for both standard spectrophotometer and microplate reader applications on the same instrument. Monochromator wavelength selection saves time and trouble of ever having to change out filters. Typical applications for this powerful reader include DNA and RNA quantification, enzyme kinetic assays and ELISA based assays. The system is ready for upgrade with a StakMax® automated microplate handling compatibility for full robotic integration. Comprehensive validation package for the system include : SpectraTest® ABS1, FL1 and LM1 Validation Plates for hardware validation of absorbance, SoftMax Pro Software validation package, Software tools for FDA 21 CFR Part 11 compliance. The SpectraMaxPlus 384 has been cited in more than 8000 publications, a testimony for its superior performance and reliability.